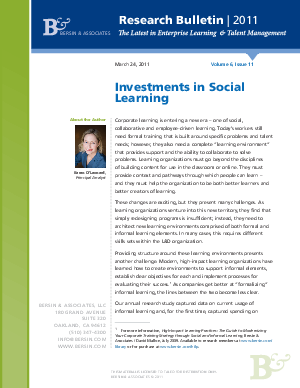 Corporate learning is entering a new era of social, collaborative, and employee-driven learning. Today's workers still need formal training but they also need a complete "learning environment" that provides support and the ability to collaborate to solve problems. Learning organizations must go beyond the disciplines of building content for use in the classroom or online. They must provide context and pathways through which people can learn - and they must help the organization to be both better learners and better learning creators. Outlined are best practices with experiences and results of Amway, The Cheesecake Factory, and U.S. Oncology.